For three years, Guts believed his mission was to pursue Griffith's dream together with him. But after coming to understand Griffith's outlook, Guts realises that he would need to leave the Band of the Hawk to become Griffith's equal and truly be called his friend. 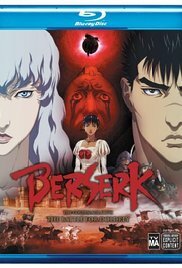 After forming a bond with Casca while they are separated from the others, Guts aids the Hawks in a bloody battle to capture the impenetrable Fortress of Doldrey from the Chuder Empire's army of 30,000 strong. A month after capturing the fortress and winning the war, Guts parts way with Griffith after defeating him in a duel. Read more on Wikipedia.